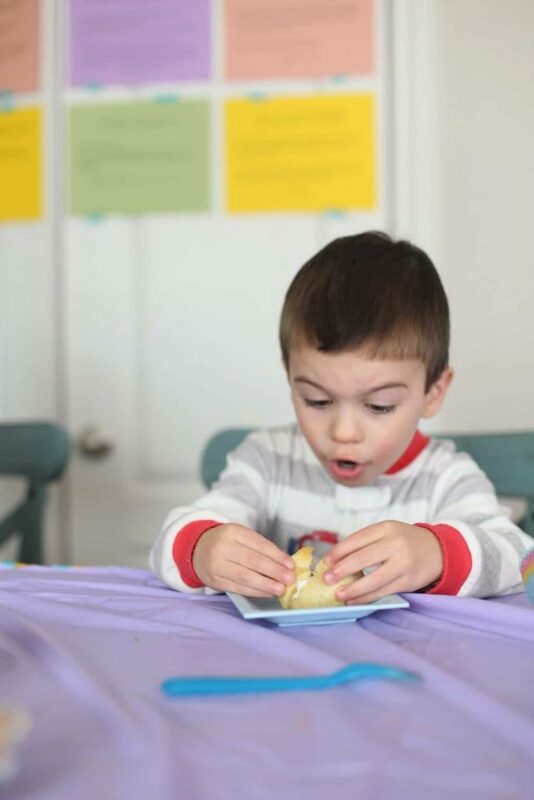 Easy Resurrection Rolls Recipe & Printable Easter Lesson - So Festive! 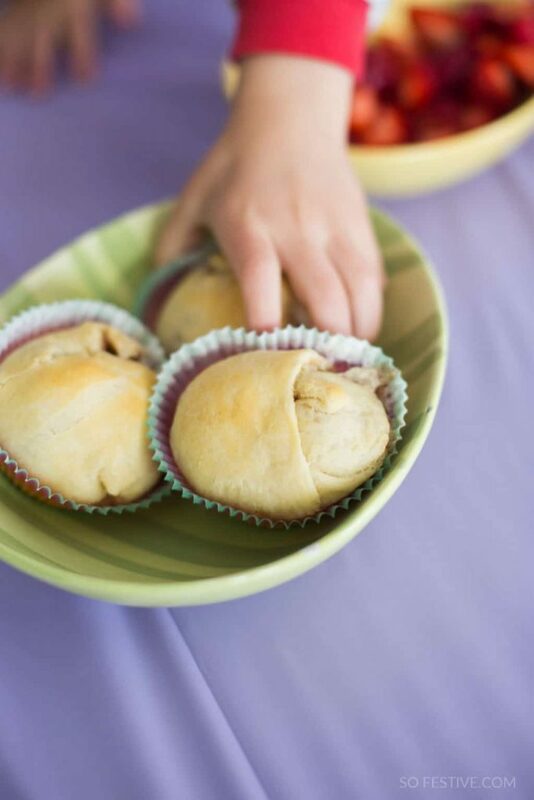 Resurrection Rolls are a simple and tasty way to teach children about Christ’s Resurrection on Easter morning. 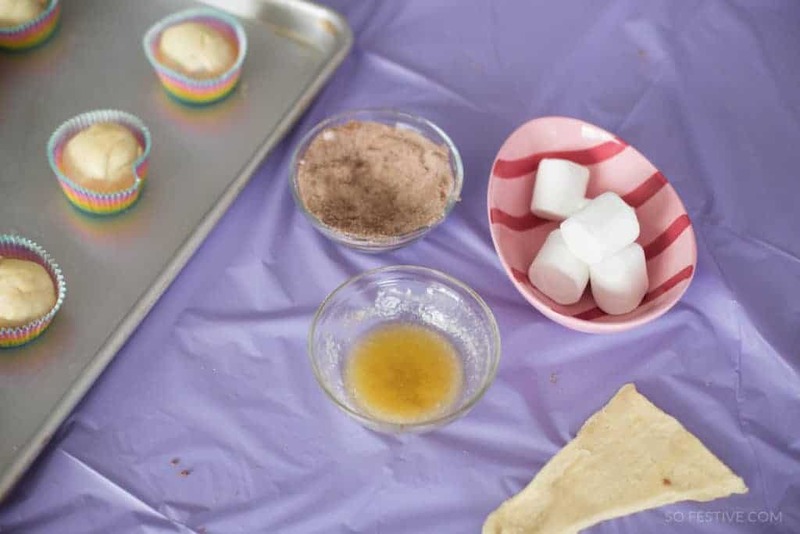 Follow this simple recipe and dialogue for not only a tasty breakfast, but a meaningful Easter lesson that focuses on the real reason for Easter. 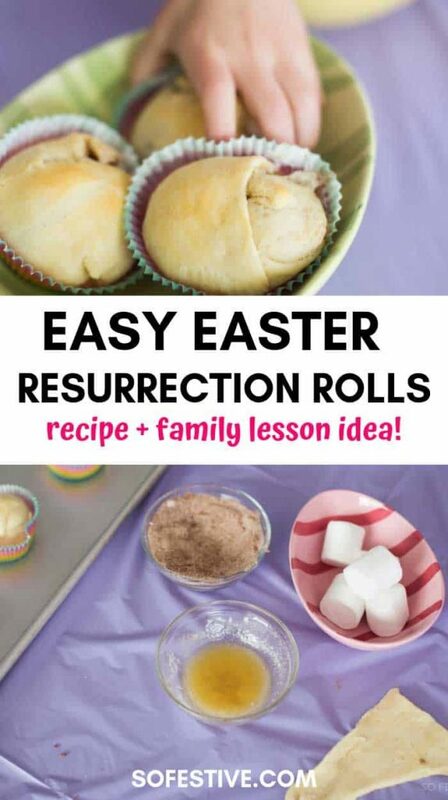 If you’re looking for simple and yummy way to teach children about the Resurrection, these Easter rolls are perfect! A few years ago, I realized that our Easter celebrations were not as Christ-centered as we wanted them. We were focusing more on Easter egg hunts and Easter baskets than on the true meaning of Easter. 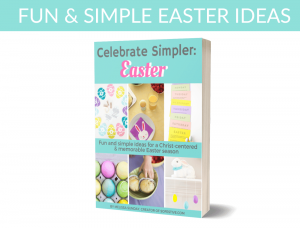 So I got to work creating Kid-Friendly Christ-Centered Easter Traditions (which you can read all about here). WHAT IS A RESURRECTION ROLL? Each ingredient and step in making Resurrection Rolls resembles part of Christ being buried, and then being resurrected! SO Fun and meaningful! You can always make these Empty Tomb Rolls for a Family Home Evening treat or activity sometime leading up to Easter. Or, use these Resurrection Rolls for Easter Breakfast! Instead of making a fancy breakfast for my family, we all made the Empty Tomb Rolls as they are sometimes called together…learning as we went along! Making Resurrection Rolls led to a great discussion about Easter and was just another way to reinforce the true meaning of Easter. Tip: If you don’t have time to make them in the morning for breakfast, you could make them for lunch, snack or Family Home Evening. I wondered if my children would learn anything from this Easter activity, but I was surprised that weeks later they were still talking about the roll being empty! It was then that I knew we had found a fun, simple new Easter tradition. And even better that it helped us all focus on the real reason for celebrating Easter! For one batch, you’ll need the following ingredients. However, I highly recommend you making about 2 rolls per person. They are tasty and so fun to make, so don’t just eat one! CLICK HERE FOR THE FREE 1-PAGE PRINTABLE RECIPE & LESSON! Tip: As you complete each step, discuss what each ingredient represents. After you have taught the first round, have your children teach what ingredient represents as they make their next roll. Preheat oven to 350 degrees. Lightly grease a large baking sheet. Combine cinnamon and sugar into a small bowl. For easy cleanup, place a disposable plastic table cloth on the counter or the table, wherever you’ll be making the rolls. Separate crescent rolls into triangles and give each person one. The crescent roll represents the cloth that Jesus was wrapped in after he died. Give each person a marshmallow. The marshmallow represents Jesus’ body. Have each person dip their marshmallow into the melted butter. The melted butter represents the oils of embalming. Then dip the buttered the marshmallow into the cinnamon sugar. The cinnamon sugar represents the spices used to anoint the body. Finally, wrap the coated marshmallow tightly into the crescent roll. Don’t roll up like a traditional crescent roll, but bring up the sides to make a good, tight seal. This represents the wrapping of Jesus’ body after death. Repeat with all rolls. Optional: for easy cleanup, place each roll inside a muffin paper. Place the rolls on a greased cooking sheet and bake for 10-12 minutes. The oven represents the tomb Jesus was buried in. I hope you get the same reaction we did! My son was so surprised to see that the marshmallow was gone. Priceless! (P.S. 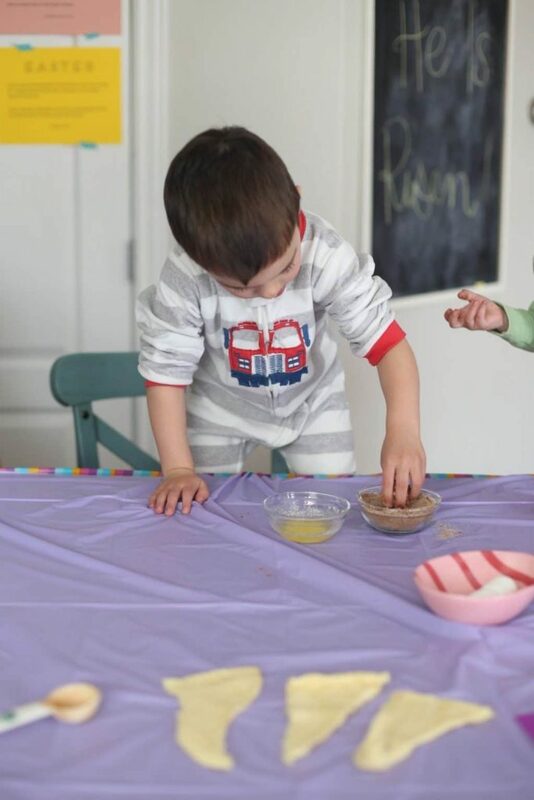 For those who have asked about the daily Easter signs in the background, they are available in our Free Holiday & Party Printables Library for Fun Club Members). If you’re looking for a simple way to reinforce the true meaning of Easter, add Resurrection Rolls to your Easter celebrations this year! 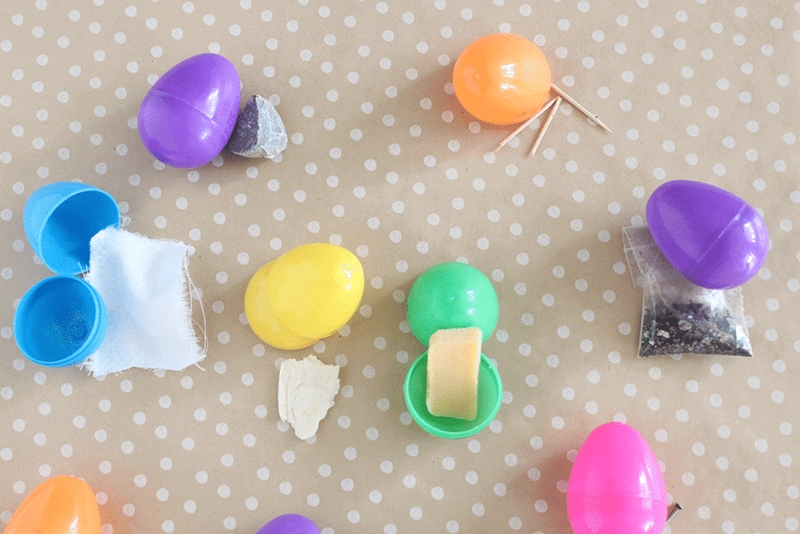 Each egg contains an object that represents part of the Easter story.Get all the details and printables here.